THE Nigeria President, Muhammadu Buhari on Monday night received in Malabo Equatorial Guinea’s highest national honour, the Grand Collar of the Order of the Independence. He has dedicated it to the people of Nigeria, who, he said, have worked tirelessly for peace in the country and Africa. Buhari in a statement by the Special Adviser on Media and Publicity, Femi Adesina, said: “I will like to express profound gratitude for the honour given to me and my people. “There has never been a time for greater neighbourliness on our continent in the interest of peace, security and economic stability than now,” President Buhari said at the investiture ceremony. As African countries faced common challenges, he said, they must strive to cooperate more to find workable solutions that will facilitate rapid socio-economic development on the continent. Buhari pledged that under his leadership, Nigeria will continue to make significant contributions to peace, political stability and progress in Africa. 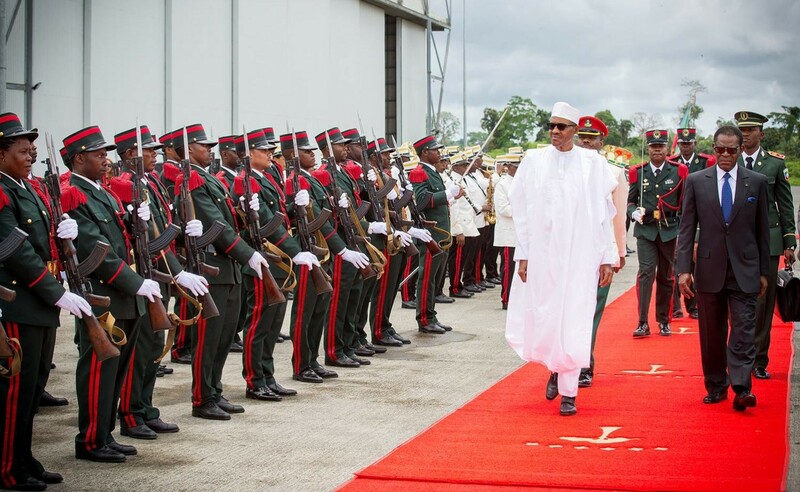 President Obiang Nguema Mbasogo of Equatorial Guinea said that the honour was conferred on President Buhari for his “personal integrity, exemplary leadership style and courage to fight terrorism in order to ensure peace and safety in Africa”. “We deemed it fit and appropriate to honour this son of Africa for the great work he is doing, which includes tackling Boko Haram, a great menace to the continent,” President Mbasogo said.